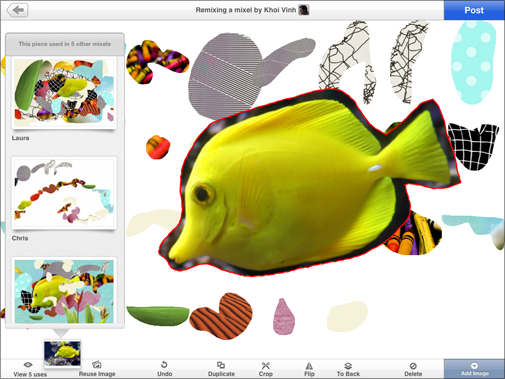 Mixel is a free iPad app combines art and creativity with social media. To use the app, you create your art collage (the “mixel”) with the elements you choose on an iPad, such as photos or images in your library, then you connect to Facebook and start sharing your art. Other Mixel users can then ‘remix’ your art. Mixel was co-founded by Scott Ostler and Khoi Vinh of The Lascaux Company. Our goal with Mixel is to turn the act of art-making into something incredibly easy, fun and even addictive. Just as importantly, we also want art-making to be deeply social. Mixel is a social network of its own — you sign in with Facebook, and you can find and follow anyone on the network to see all the great work they’re producing. You can also comment, like and share the art, just as you would on any other social network. But we chose collage for a very important reason: it makes art easy. Photos, the component pieces of every collage, are among the most social and viral content on the Web, and allowing people to combine them into new, highly specific expressions of who they are and what they’re interested in is powerful. Collage also has a wonderfully accessible quality; few people are comfortable with a brush or a drawing implement, but almost everyone is comfortable cutting up images and recombining them in new, expressive, surprising or hilarious ways. We all used to do this as kids.